The global financial crisis, when it broke in 2008, seemed likely to mark a conclusive end to the neo-liberal hegemony that had dominated world politics and the global economy for more than three decades. Yet, to the consternation of those who were ready to welcome such a denouement, the immediate reaction of popular opinion in many western countries was to “hold on to nurse”; ordinary voters sought refuge in what they knew – or had been taught to believe. It is only gradually – and recently – that faith in the hitherto prevailing orthodoxies has begun to weaken. There is now quite discernibly a flagging confidence in the infallible and self-correcting market, in the rationale that tries to justify huge rewards for a tiny minority, in the trustworthiness of bankers, and even in austerity as the correct response to recession. As a consequence, “the left” is gradually rediscovering its intellectual self-confidence, and beginning to look to a post-neo-liberal world; the timidity of New Labour is being replaced by an increased readiness to engage afresh in the battle of ideas. But while all kinds of ideas are being either revived or newly developed, and there is a renewed emphasis on and confidence in the role of social and environmental policy, there remains one hugely significant “no-go” area. There is a striking unwillingness to tackle the central issues of economic policy. It was significant, for example, that, in the seven issues that Tony Blair, in his New Statesman article, advised Ed Miliband to focus on, there was no mention of the state of the economy. We should not perhaps be surprised, since Tony never had much interest in or knowledge of economic policy – and he is not, of course, alone among leading left politicians in disavowing any interest in economic affairs. The sad truth is that most have simply assumed, like Tony, that economics is a difficult and technical business that can safely be left to the bankers, and is therefore no longer their responsibility. They tell themselves that the economic process is probably immutable anyway, and that the real business of politics is in any case about other easier and more emotive issues. Most are content to accept advice from supposed experts, which usually means that they have no option but to go along with whatever may be the prevailing orthodoxy. Even a Gordon Brown – who was widely thought for a time to be a master of economic policy – can now be seen to have been merely a prisoner of his orthodox advisers. The dead hand of long-established orthodoxy continues to weigh down on the current Labour leadership. Even Eds Miliband and Balls, who clearly have some understanding of what is needed, find themselves constrained by the fear that anything too overt by way of new thinking will open them up to damaging attack. They have to move cautiously; and that inhibits them from developing and advancing a fully comprehensive and coherent alternative policy. Yet the issue of how the economy should be run, and in whose interests, is surely the central issue in democratic politics. Advances in approach and policy on other issues will count for little if the central tenets of neo-liberalism are allowed to remain dominant in the way our economy is run. If the left wants to engage in meaningful debate on the questions that truly matter and to make a real bid for power, it cannot avoid the essential features of economic policy , and it cannot expect to carry the day just by taking occasional potshots at George Osborne. That is too easily deflected with the demand “what would you do?”; and if the answers are merely occasional hostages to fortune offered up without being established in a context that is coherent, comprehensive and compelling, then that whole, centrally important territory is necessarily conceded. What would such a context look like? It would have to do more than provide an intellectually convincing critique of neo-liberal orthodoxy, though it might take that as its starting point; it would have to offer a complete alternative strategy that made sense and held together in economic terms and was credibly able to promise better results than what had gone before. There should, in my view, be five elements in an economic policy that marked a real change from the failed neo-liberal nostrums. They are a focus on competitiveness, credit creation for productive purposes, an agreed industrial strategy to rebuild the productive base, restoring macro-economy policy as the central responsibility of democratically accountable governments, and, above all, making full employment the central goal of policy. Let us look at each of those in turn. The competitiveness of British industry, or lack of it, has of course been the great taboo of our economic policy for decades. It is almost totally ignored and virtually never discussed. Though various indices of competitiveness are maintained, they are never referred to and are apparently regarded as irrelevant to any consideration of the course our economic decision-making should take. When Alastair Darling published his 300-page account[i] of his term as Chancellor of the Exchequer, there was not a single reference to competitiveness as an issue or to its concomitant, the exchange rate. As I know from my own experience as a young backbench MP in the 1970s, it was extraordinarily difficult even to table parliamentary questions on the subject of exchange rate policy which was regarded as too sensitive to be discussed. Yet a moment’s thought should tell us that, in a post-war world that has seen the rapid industrialisation of new economic powers, including the rise of the world’s second largest economy in a remarkably short time, it would be extraordinary if the UK could simply assume that our place in the competitiveness stakes could remain unchanged without any care or attention being paid to it by our policymakers. It is of course not quite true that the issue has not been the subject of intervention; our position on the exchange rate for sterling has always been that any depreciation should be resisted. This has been one of the cardinal, but unstated, features of our economic policy and is one of the most important consequences of allowing the requirements of the financial economy to take precedence over the real economy, and of accepting that monetarism is the only correct basis of a sensible economic policy. This distortion of policy has a long and sad history. As long ago as 1925, Winston Churchill famously observed, as Chancellor of the Exchequer, that he would rather see “Finance less proud and Industry more content”. In more recent times, Denis Healey, having exhausted the reserves in defence of sterling in 1976, rejected the IMF advice that monetary policy should be framed in terms of Domestic Credit Expansion (DCE) – an open invitation to grow the economy on the basis of a lower exchange rate and export-led growth – and preferred instead to adopt monetarist orthodoxy and the defence of sterling as the key features of his Chancellorship. At that same time, Jim Callaghan as Prime Minister told the Labour Conference that “you can’t spend your way out of recession” – a nonsense then as it is now. What he was really trying to say was that “we dare not try to escape from stagflation by stimulating the economy, because growth would inevitably create insuperable problems of rising inflation and worsening trade deficits.” The problem he was really grappling with, in other words, was not the failure of Keynesian economics, but a catastrophic, though unacknowledged, loss of competitiveness. That issue remains at the heart of our economic problems today. Austerity is regarded, at least in government quarters, as our only possible policy option, because it is accepted that to try to grow our way out of recession would be to expose the fact that we no longer have the productive base to allow us to do so. The parlous state of that manufacturing base, and the disastrous reliance placed on a financial services sector that – even at best – brought benefits to only a small part of the population, are only the most recent outcomes of a policy that has for decades preferred to avert its gaze from the truth of our situation. A loss of competitiveness will be felt most directly in the highly competitive international markets for mass-produced manufactured goods, and that has been exactly our experience. This resolute refusal to address the issue of competitiveness is in marked contrast to the policies pursued by other, more successful economies. Those economies that have grown rapidly over recent decades have taken a quite different approach. The new economic giants of Asia, for example, have focused on trying to hold down their exchange rates so as to maintain the competitive advantage that rapid industrialisation – with its consequent economies of scale, quick returns on investment, and high profits to be re-invested – is able to produce. China, in particular, has clearly recognised the importance of holding down the value of the renminbi over the whole period of its rapid growth, while Japan, intent on kick-starting a sluggish economy, is taking decisive action to bring down the value of the yen. An economy like Singapore, with an economic performance to its credit that puts us to shame, has quite specifically focused on competitiveness as the central indicator of the efficacy of its policies. And Germany, Europe’s most successful economy and exporter, pays constant attention to competitiveness indices, such as unit costs in manufacturing, export prices and measures of productivity growth. Despite this persuasive evidence that other more successful economies may know something we don’t, we choose to pay the issue no attention. We have been brought up for generations in the belief that manipulating the currency (other than upwards) is somehow morally shameful and – in accordance with all good morality tales – will in the end do no good. It is an article of faith – never examined in the light of actual evidence – that a devaluation will quickly be eroded by inflation and will make little difference to economic performance. My co-author on an earlier occasion[ii], John Mills, has however recently examined the statistical evidence in respect of twenty devaluations in different countries and at different times. [iii] He is able conclusively to disprove the contentions that devaluation is negated by inflation and that it does not help living standards to rise. It should come as no surprise to most people, and especially to those who recognise the market’s alacrity in responding to stimuli, that reducing prices in the international marketplace will stimulate sales, and that increased sales and profitability will produce greater investment and employment to the advantage of the economy as a whole. But, it may be objected, if the exchange rate is so important, surely the recent depreciation of sterling should have stimulated the economy? Yet we are still bumping along at a couple of percentage points below the 2008 GDP peak. Does this not show that devaluation is not a panacea and cannot be relied on to change our fortunes? Let us first make the point that the depreciation of recent times is typical of our experience of devaluation; it has been an ex post facto response to an increasingly intolerable loss of competitiveness, and is the minimum required just to keep us in business. It is far from a considered attempt to achieve a desired level of competitiveness of the kind that our successful competitors take for granted as the sine qua non for export success. But let us also concede that a competitive exchange rate is a necessary but not sufficient condition for export-led growth. Without it, nothing else will be effective to bring recession to an end and to make up the ground we have lost. But with it, there is then good reason to look to other measures that would at least then have a good chance of working. The most important of such measures is my second major issue – the provision of sufficient credit for investment purposes. We have grown so accustomed, after nearly four decades of monetarism, to regarding control of the money supply as an essential weapon in the battle against inflation, that we have lost sight of its true significance. The monetarist approach takes a narrowly focused, backward-looking and static view of the economy; it treats monetary policy as though it were a minefield, and any growth in the money supply as a dangerous beast that must be kept strictly muzzled and leashed. The consequence is that monetarism has become a recipe for slow growth and high unemployment. It allows little account to be taken of the potential for a market economy to grow – surprisingly, since the proponents of monetarism are the most committed self-proclaimed supporters of the “free” market. As soon as there is any sign of growth, an almost superstitious fear of inflation (which is almost always code for a rise in wage levels) dictates that demand must be choked off and job growth restrained. The only mechanism available to undertake the task of controlling the money supply is the manipulation of interest rates, so that, in addition to the intrinsically anti-growth stance dictated by the policy, the cost of borrowing for investment is forced up and becomes a further barrier to improved competitiveness. Higher interest rates, and the consequently high exchange rate, are a poorly focused and slow-acting counter-inflationary instrument that produce a good deal of collateral damage while addressing a problem that in recessionary times is hardly the top priority. The limitations of interest rates as a tool of macro-economic policy can be clearly seen in the unsuccessful current attempt to use lower interest rates as a stimulus to an economy mired in recession; without help from other elements of policy, bringing down interest rates is, as Keynes observed, like pushing on a piece of string. The preoccupations of monetarist policy with restraint and fighting inflation are all the more remarkable when we consider what really happens in the real world beyond monetarist theory. In this world, there is little concern about monetary growth and no attempt to restrain it. The size of and growth in the supply of money is almost entirely within the control of the commercial banks. Their interest is to lend as much as possible, and they do so, constrained only by their own need for security if irresponsible lending goes wrong, and totally unconcerned about the effect any growth in the money supply might have on the economy as a whole. No one else seems to notice this, let alone do anything to restrain it. The consequence is that, in an economy that is in principle run on the basis of strict control over the money supply, there is virtually a private sector free-for-all. Bank lending (or, as we should say, bank credit creation) accounts for by far the overwhelming proportion of money and monetary growth in the economy and – significantly – is mainly devoted to lending secured by property, which means in most cases, residential properties which are the most reliable and easily realised form of security. This is not only damaging in itself, not least in the stimulus it provides to inflation, but it also diverts investment capital away from productive purposes. These barely recognised characteristics of what passes for macro-economic policy are in marked contrast to the approach taken at other times and in other countries. We have focused for so long on restraint and protecting the value of existing assets rather than creating new wealth that we are simply unfamiliar with the thinking that has enabled other economies to use monetary policy and credit creation for productive purposes as essential elements in boosting economic performance. History provides compelling evidence to support Keynes’ pre-war contention that “there are no intrinsic reasons for the scarcity of capital.”[iv] Two of the most striking instances of how credit creation was used, not to inflate the property market for private profit, but to stimulate rapid industrial growth, were the United States at the outbreak of the Second World War, when Roosevelt used the two years before Pearl Harbour to provide virtually unlimited capital to American industry so that the country could rapidly multiply its military capability, and Japan in the 1960s and 1970s, when Japanese industry was enabled by similar means to grow at a rapid rate so as to dominate the world market for mass-produced manufactured goods. More recently, China has used similar techniques to finance the rapid expansion of Chinese manufacturing. The Chinese central bank, under instructions from the government, makes credit available to Chinese enterprises that can demonstrate their ability to comply with the government’s economic priorities. This is admittedly, in principle at least, easier to bring about in a totalitarian regime than in the UK, but in practice there is nothing to stop the government from requiring the Bank of England to create credit (at no cost) for specific purposes. Indeed, the Bank of England has already undertaken quantitative easing on a significant scale. The difference between that exercise and what is now required is that the quantitative easing so far undertaken has been used for the purpose of shoring up the banks’ balance sheets, whereas an effective creation of credit for investment purposes would be applied directly to the strengthening of our productive base. The rationale underpinning this strategy is a simple one. Whereas a sudden expansion in the money supply would, according to monetarist theory, feed directly into increased inflation, that would be true only when the economy is already fully utilising its productive capacity. As we have seen, it is all too easy to assume, and it usually is assumed by monetarist theorists, that there are strict limits to that capacity – an assumption that is all too likely to be validated by the anti-growth bias of monetarist policy – and, again as we have seen, it is unfortunately true of an economy that is fundamentally uncompetitive. But where an economy is manifestly operating at less than full capacity, there is no point in restricting the money supply – especially in the matter of capital for investment. What is needed in a recession is a lift in demand so that markets at home expand, coupled with an improvement in competitiveness so that exports are encouraged. In these circumstances, a deliberate policy of investment credit creation would bring the double benefit of providing readily available finance to support productive investment and to rebuild a sadly weakened manufacturing base, and at the same time encouraging a fall in the value of sterling as the foreign exchange markets recognised that this was a deliberate aspect of the policy; these are, after all, key features of the strategy now being pursued by Shinzo Abe’s government in Japan and are justified – and largely accepted by Japan’s trading partners – on the basis that everyone will benefit from a more buoyant Japanese economy. Monetarist fears that any increase in the money supply will lead straight to an unacceptable inflation have in any case already been disproved by the experience of several countries with quantitative easing, and, on the contrary, is essential if we are to escape from what Paul Krugman calls the “liquidity trap”. It is even less of a threat when the monetary expansion takes the form of capital invested in new productive capacity. As Keynes argued, credit creation for such a purpose will not be inflationary if it results in increased output. This means that this second essential element in an effective economic policy is, of course, dependent for its effectiveness on the third element – the development of an agreed industrial strategy. This does not raise problems for a centrally directed economy such as China, nor is it a difficult issue in wartime when the needs are pretty obvious; and, while a country like democratic Japan, with its more structured society, might find that the common good might be more readily accepted as the basis for action than it would be in the West, the greater scope for debate on what shape it might take in peacetime and in a western country like the UK should not mean that it is any more difficult in principle. An effective industrial strategy for Britain would require agreement and support from each of government, industry and the banking sector. But the task is not an impossible one; the urgency of what is required should surely concentrate minds. The strategy need not “pick winners” in detail or operate in too prescriptive a manner but would establish criteria and measures of performance that would provide a context within which the normal processes for identifying worthwhile investment opportunities could operate so that a great deal of the decision-making could be left to the usual agencies. Proponents of the current orthodoxy will of course argue that to attempt such an exercise would be to usurp what is the proper role of the market. But that is to ignore two obvious factors – the current failure of the market to produce satisfactory outcomes and the successful experience at other times and of other economies with just such a strategy. A successful industrial strategy would, of course, focus on manufacturing. It is a competitive manufacturing sector that has underpinned the growth of other economies by providing access to mass markets and economies of scale. It is manufacturing that uniquely provides the stimulus to innovation, the quick return on investment, the development of new skills and the creation of new jobs – all elements in a successful economy that have sadly eluded us over a very long time. It is manufacturing that makes possible the strategy of investment credit creation by offering a sufficient return on that investment in terms of increased output so as to provide the virtuous circle of increased investment leading to increased output and back again to yet greater investment that has served other economies so well. The commitment of government, industry leaders and the banks to the development of such a strategy – encouraging its development, in other words, as the outcome of a wide-ranging consultation so that it thereby gains considerable popular support and understanding -would point the way to a further essential reform which constitutes the fourth element in a successful economic policy – the restoration of macroeconomic policy to its proper place as the responsibility of government. The elevation of a supposedly “independent” central bank to the role of unchallengeable arbiter of macro-economic policy was widely applauded when Gordon Brown introduced it and is still virtually never questioned. It can hardly be argued, however, that it has produced successful results; and there is now at least a greater disposition to ask whether bankers are as objective and free from self-interestedness as was thought. The evidence is that handing monetary policy over to the tender care of a central bank is simply a reinforcement of the current and increasingly discredited orthodoxy that inflation is the only concern and proper focus of monetary policy and that its treatment is simply a technical matter that is properly the preserve of unaccountable bankers, and is not to be trusted to unreliable politicians. 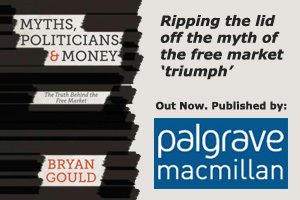 Quite apart from the undemocratic nature of this approach, whereby the most important decisions in economic policy-making are removed from the democratic arena, we have paid a heavy economic price for allowing the bankers’ interest to prevail over the interests of the economy as a whole. It is easy to see why the bankers – and the economists who increasingly work for them – should support this. It is less easy to see why the politicians should so readily have accepted it. Yet the answer is fairly clear. It has suited the politicians well to be able to argue that the travails of the economy arise, not by virtue of their mistakes or deficiencies, but as a consequence of inexorable economic forces which must kept in check and marshalled by expert technicians. In this way, our governments have been able to disclaim any responsibility for policies (and their consequences) for which they are ultimately responsible. An economic policy that broke the shackles of current orthodoxy would necessarily have to be removed from the exclusive and self-interested control of bankers. It would need to be driven by politicians who saw the need to ensure that the wider interest is carried into policy and is an essential element in setting its direction and gaining for it the necessary support. The aim should be to re-establish the full range and purpose of macro-economic policy. It would no longer be a simple matter of tasking the central bank with restraining inflation and then allowing market forces to get on with it. Other important outcomes – full employment, a reasonable and sustainable rate of growth, properly funded public services, and so on – would come back into the reckoning as the legitimate goals of policy. Governments would expect then to be judged on their success or otherwise in achieving those goals of a more broadly based economic policy. The outcome of reviving the public debate about macro-economic policy – a debate that has been in limbo for decades – would be not only a better performing economy and a more integrated society, but also a more vibrant democracy, as voters realised that their views might count after all. As we have seen, an important benefit from a renewed debate about economic policy would be the possibility of replacing ideologically driven preoccupations, such as preserving the value of assets, reducing the size of government, and relying on austerity to escape recession, with goals that more accurately reflect the wider interest and represent a more comprehensive measure of economic success. Prime amongst such goals would be full employment – the fifth element in a more effective economic policy. Full employment as the central goal of policy would not only be the most important step that could be taken to relieve poverty and to reverse the destructive growth in inequality; it would also be a huge step towards a more inclusive and therefore more successful economy. There is, after all, nothing economically efficient about keeping large numbers out of work and unwillingly dependent on benefits. Full employment is the hallmark of a properly functioning economy. An economy that was competitive in the sense that it could find profitable markets for its produce, and for which investment capital was available to finance increased production, would be able to use the productive capacity of its total workforce. Conversely, a high or persistent rate of unemployment shows that those conditions do not apply. To restore full employment as the central goal of policy and as the measure of that policy’s success would revolutionise the way in which management of the economy is regarded. Once it was accepted that full employment is achievable, the success or otherwise of economic policy would be judged according to a criterion that was easily understood by the public. The value, in both economic and social terms, of the contribution that labour makes to society’s well-being would be newly acknowledged. Full employment would be seen as determining the direction of economic policy but requiring that other aspects of policy should also help towards this desirable outcome. It would be seen as important that the workforce was properly supported, through measures like comprehensive rights at work and appropriate skill training, and that the underlying services that guarantee the health and educational levels of the workforce were raised to a high level. The well-being and effectiveness of that workforce are, after all, our greatest asset. This would represent, of course, a significant move away from the current orthodoxy which regards labour as just another production cost, to be kept always as low as possible. That approach may or more likely may not make sense from the viewpoint of the individual business, but it is certainly and literally counter-productive from the viewpoint of the economy as a whole. A change in approach would also run counter to the current, but usually unstated, belief that wage costs are too high and that the key to improving competitiveness is to drive them down – not least by allowing unemployment to remain high. These five elements of an economic strategy to replace neo-liberalism would certainly represent a clear break from the orthodoxy that has dominated the world economy for so long. It has the merit of offering a real choice to the voters and enthusing those who are keen for change, without departing in any way from mainstream economics. The overall strategy is recognisably Keynesian and would be supported by that growing group of economists that is now confident that neo-liberalism as an economic doctrine has had its day. It allows a coherent critique to be made of an orthodoxy that is manifestly failing, not only in the UK but in Europe and elsewhere – an orthodoxy that uses austerity to drive us deeper into recession and is increasingly defended not on its own merits but by the schoolboy tactic of demanding sight of an alternative. Each of the five elements in my proposed strategy supports the others and helps to create a coherent whole; objections to the relevance or practicality of one element can be met by pointing to the supporting role of the others. Most importantly, it means that those who increasingly highlight the failures of neo-liberalism are not denied a political victory by their reluctance to tackle this malign doctrine on the centrally important territory where its deficiencies are most apparent and damaging. An economic strategy built on these elements would not only produce a better economic performance but would commend itself to the electorate as well.